Are you ready to celebrate another book release because that’s exactly what we’re doing today! Continuing the fun, Heather L.L. 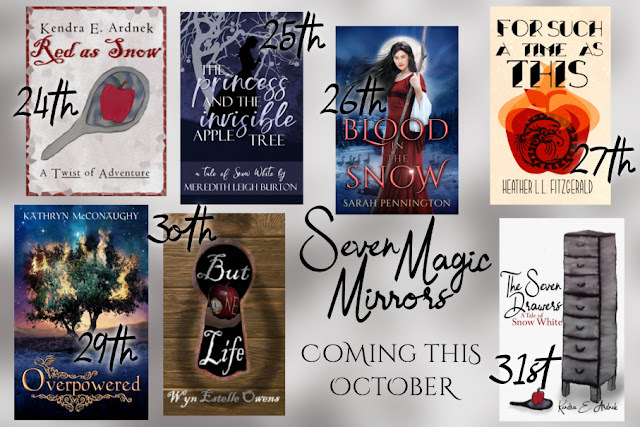 FitzGerald has released her Snow White reimagined with her story For Such a Time as This in the Magic Mirrors Collection. Does that title maybe sound familiar? If so, you might recognize it from the story of Queen Esther in the Bible. But wait! I realize what you might be thinking! Didn’t I just say this is a Snow White retelling? I sure did, which means this story is about Esther in a unique fantasy fairytale mashup with Biblical elements! If you want to know more, come meet our very own Esther, but let me introduce you to Heather’s book first. Queen Vashti the Fair is not only the wife of King Xerxes, she is also—secretly—an enchantress. But thanks to Haman’s flirting she now has a new distinction: deposed. While Vashti loses perks like her holographic trousseau, Haman continues to enjoy his position as second in command, much to Vashti’s vexation. Mordecai was once a soldier in the king’s private guard, but has since carved out a self-sufficient life for himself and niece Esther. Although citizens are required to have an identity chip for governmental transactions, he and Esther live off the grid and out of big-government’s greedy reach. When Mordecai’s old nemesis, Haman, turns up demanding Esther’s participation in the king’s upcoming beauty pageant, Mordecai arranges to have her transported to the Vale of Seven Dragons for protection. But not before Esther’s charm makes her a target on Vashti’s radar, as Vashti seeks to undermine the outcome of Xerxes’ hunt for a new queen. Esther is caught between loyalty to her uncle and fear for her future—whether in the care of dragons or in the palace of the king. Will she be brave enough to embrace her destiny, wherever that may be? Esther has no memory of her parents. She only knows they died protecting her. Knows that they were heroes. In the basement of the local synagogue, her father and mother, a doctor and nurse, had set up a triage center for wounded soldiers. They brought Esther to work with them, believing the synagogue to be one of the safest places during a war. After all, a house of worship was a refuge that even the enemy respected. But when the synagogue takes a direct hit, both parents lose their life. If not for her father’s body protecting her own, Esther would have perished as well. Although she wishes things had turned out differently, she could not imagine loving her parents any more fiercely than she loved her Uncle Mordecai. He had given everything up to provide Esther with a loving, secure home—including his eligible years as a bachelor. Now soldiers have come to their obscure little farm, learning from locals that her beauty must be included in the upcoming pageant to find King Xerxes a new wife. Though Mordecai has raised Esther to mistrust the government, would it be so terrible to be queen? Mightn’t she help the people of the realm of Susa—especially those in her hometown of Parthia—and be an influence for good? But what about Mordecai’s wishes? Of course she trusts her uncle, but why—why—would he send her into the fearsome clutches of dragons? There doesn’t seem to be an easy answer or an easy choice. One thing is certain, her faith must extend beyond that of her uncle and find its rest in the hands of a sovereign God. Award winning author Heather L.L. FitzGerald writes from her home in Texas, while dreaming of being back in the Pacific Northwest, where she grew up. She is drawn to stories that become good friends–friends you want to revisit–the kind you wish to keep close. Those are the type of novels Heather aspires to write, ones worthy of delicious coffee and a lingering relationship. The Tethered World was a finalist and The Flaming Sword won the 2017 OCW Cascade Award for Speculative Fiction. So far in 2018 The Genesis Tree has become a finalist for a Realm Award, Selah Award, and an OCW Cascade Award. Heather’s a member of ACFW, Manent Writers, and CAN. Unicorn Quester: Character Spotlight <— You are here!